Back when I was first awakening to the world of cooking, food brands of all kinds were competing to capture our attention with FREE leaflets of mouth-watering recipes in the grocery stores. These recipes were some of my first as I ventured into the kitchen as a teen. 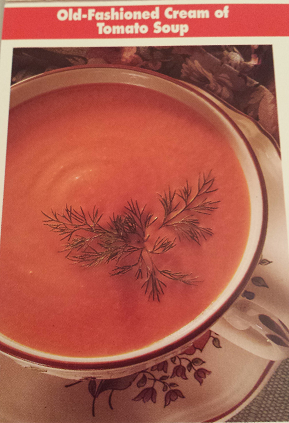 I found this recipe for Old-Fashioned Cream of Tomato Soup years ago at an IGA, and have made it numerous times over the years, though not recently. Step #1: Pour hot soup into blender; put on lid. Step #2: Put hand on lid, press “puree”. Step #3: Stop blender, remove lid, check the state of the soup. Step #4: Decide it’s too chunky still; replace lid, hold lid, press go. Step #5: Hot soup flies up and hits lid, scalding hand. Hand releases juuuust enough to release soup in a perfect circle spray pattern, all over the kitchen. Yup. That’s what they told me to do! Ummmm….. no. But jeepers, what a mess that was to clean up! – imagine hot red soup sprayed in a perfect radius all. over. the kitchen. Worth it, though – so yummy! And thank God for hand blenders now to avoid the blender shenanigans! MELT butter in large heavy saucepan over medium heat. SAUTE carrots, onion, garlic and celery about 5 minutes or until tender. STIR in flour; add tomatoes, breaking apart, chicken broth, sugar and pepper. BRING to a boil; cover and simmer 15-20 minutes, stirring occasionally, until vegetables are tender. PUREE in batches in blender or food processor; return to saucepan. WHISK in milk and heat through. 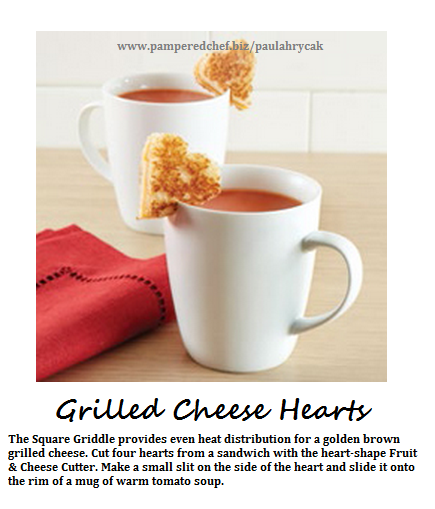 ps – this is a wonderful tomato soup recipe to make for using in this cute Valentines Day idea: mugs of soup garnished with heart-shaped grilled cheese sandwiches. Grab Pampered Chef’s Fruit and Cheese Cutters for this project – they’re perfect!